Here in Michigan’s great southwest we are lucky to be in a land abundant with farms, among these is Granor Farm, a certified organic produce and grain operation. What makes Granor stand out is not only their commitment to providing fresh, organic, local produce, but their robust outreach model that invites the community to come have memorable experiences on the farm. A large portion of this outreach is driven by Granor’s chef, Abra Berens. Abra joined the Granor farm team in 2017, with the mission of creating a fine dining experience on the farm where people could come and taste fresh vibrant food, right from the grounds that it was grown on. She is the mastermind and the lead chef behind the Taste of Granor farm dinners. These dinner events give community members an opportunity to visit the farm, tour the fields, and taste the bounty. Abra uses cooking as a tool to build a connection between consumers and producers. She understands both sides of the equation through years of working in fields and in kitchens, and it shines through in the meals she creates that showcase the best of each seasons harvest. 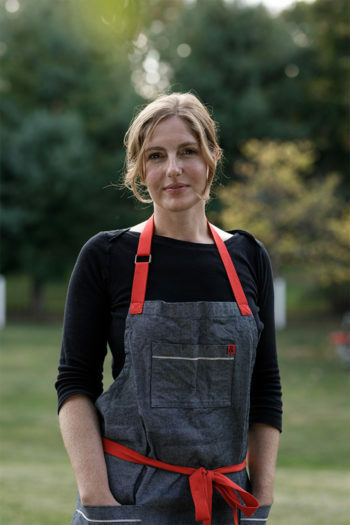 She ensures that at the end of each meal not only are you left with a satisfied stomach, but a deeper appreciation for fresh, locally grown and raised foods that taste great, are packed with nutrition, and help sustain our farmland.